How could I forget Ramassery idli? There are a hundred wonderful variations of this ancient, flawless dish. Why spoil it? It was on board a Vistara Airlines flight that I first tasted the ghastly concoction called idli manchurian. It was my first time on the airline. I was happy. The distinct airline smell was absent. You know the one I mean? The explosive combination of closed lavatories, chemical air freshener, deodorant, all overlaid by the scent of hot food stuffed into trolleys and crammed into a small space—like a gassy burp waiting to happen. Then the food came. I should have paid more attention to the flight attendants as they listed out the menu. But I was stunned that we were actually getting something to eat rather than fancy-packed nuts at four times the normal cost a la Indigo. Vistara’s cardboard containers looked smart with pencil art like the ones Chumbak and the Elephant Company have popularized. I took a bite and spat it out. Why, oh, why, were they messing with a recipe that reflected the scent of South India? According to the late Kannada scholar, D. L. Narasimhachar, who has edited ancient treatises such as Kumaravyasa Bharata—a medical work; and Vaddaradhane, which talks about the life of a Jain muni called Bhadrabahu, the word “idli” has been in vogue– in Karnataka certainly– for over 1000 years. I learnt this from Shatavadhani Dr. R. Ganesh, a Sanskrit and Kannada scholar in Bangalore. South Indians like me wake up to the scent of idlis. I may not be able to identify the scent of a Merlot but I can smell the “idli-vasanai” or “idli-smell” from across a playground. 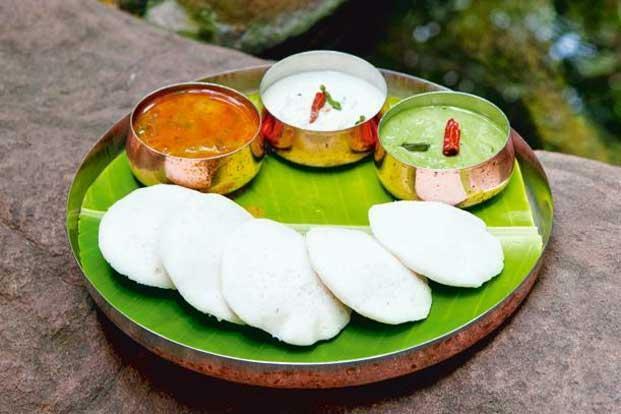 In Bangalore, scores of darshinis—open cafes where you stand and eat– serve jasmine-soft idlis to patrons before dawn. We scarf down three or four idlis with chutney and sambhar before walking briskly around lakes and gardens to sweat it off. If you don’t like plain idlis, there are Kanchipuram idlis, steamed in baskets with carrots grated on top; thatte idlis, about the size of a plate; button idlis, also called bullet idlis that hit you with tiny dollops of round, white, goodness; sannas which are the Goan version of this bland, fermented base that accepts all flavours like a mother (except Manchurian); leaf-idlis or Mudde idlis, the Mangalore version, in which the batter is poured into a cone made with aromatic kewda or screw pine leaves; kotte idlis, also Mangalorean, where you use jackfruit leaves as cones; kuzhi paniyaaram of Tamilnadu, where you fry the idli batter that is spiced with the vagar or thalichu-kottal of black mustard seeds, urad dal, diced ginger, green chilies and curry leaves in tiny containers— savory muffins if you will. If all else fails, you can have rava idlis; podi idlis where the idli is cut up and mixed with a powder of milagai-podi or idli-chili-powder and sesame oil; or even the currently popular ragi idlis. With such a dizzying array of choices, why stray so far away from the dish that goes back to the 10th century if Shivakoti Acharya’s kannada treatise, Vaddaradhane, is to be believed? Food historian K.T. Achaya believes that the idli in its current form with Ponni broken rice mixed with the urad dal in a 4:1 proportion came from Indonesia. That may be, but it took us South Indians to perfect this painstakingly ground, flawlessly proportioned, fermented batter of urad dal and rice. Why add Chinese infusions to a dish that is already an Indonesian-Indian fusion dish in the first place? That riled me up. To call an idli unpalatable is like telling a Punjabi that his maa ki dal is wanting in taste; or telling a Bengali that her fish is flavourless; or telling a Hyderabadi that his biriyani is insipid. “What about North Indian dishes that aren’t palatable to South Indians?” I asked silkily. My sarcasm was lost on the young woman who stared blankly at me. There is nothing worse that being sarcastic and not being understood. I decided to take the direct tack—or in my case, the direct attack. “Do you make an undhiyo-manchurian as well?” I asked. That wasn’t the point. The point was why the airline was tampering with only South Indian recipes. “We should get together and protest like that Hardik Patel is doing,” someone said. “Or they should use these foreign flavours to improve on dishes like undhiyo,” I said virtuously, with visions of an improved undhiyo in my mind. Wrong statement, I realized a moment later. “Why? You don’t like undhiyo?” My Gujarati neighbour, who had until now, been an ally glared at me. No longer could I count on him to be a idli-supporter, I realized. He wouldn’t mobilize Hardik for the cause of idlis. I tried to back-pedal. “I’ve never eaten an undhiyo I like,” I said. “It is certainly better than your aviyal,” he replied. “Like our undhiyo,” he replied. We were at stalemate. As dishes go idlis are like Mother Earth. You can throw any garbage on top of them and they will accept. Undhiyo and Aviyal on the other hand, are perfect in their own way but not crowd-pleasers. As for me, I don’t like undhiyo; then again, I don’t like aviyal either. Even to eat with adai, which is the way Tamilians eat it. Shoba Narayan filled out the complaint form against the invasion of Manchurian in the idli department. 3 replies to How could I forget Ramassery idli? A wonderful piece, hilarious yet gently pushes the point home. As a software professional, we are subjected to these ‘in’humane experimentation by the gods called Caterers. For a long time, I always held the belief that there are few dishes that can’t really be spoiled. Wrong. Some of these artisans have mastered the art of destroying the very fundamentals of cooking and come up with some tasteless stuff called Idli that looks more like discuss and less like food. Manchurian invasion is the next step in this direction. I just wonder, as A,B,C.. are fundamentals, Idli is the basis vector for south indian cooking. It pains me on how it’s possible to really make this bad..
Aviyal in this article was a strange coincidence given that this is Navaratri where Mahabharatha stories are recited and Aviyal’s origins from the same good old saga. What is the link between aviyal and Mahabharatha, Sir?